Haillie Taylor, a 2012 Wood River High School graduate and current member of the Colorado Mesa rodeo team in Grand Junction, recently competed in the first of four fall rodeos in the Rocky Mountain region college rodeo season. This one took place at Southern Utah University in Cedar City, Utah. There, Taylor finished first in breakaway roping with a 2.4-second time in the long go-round and fifth overall in the average for the two-day rodeo. 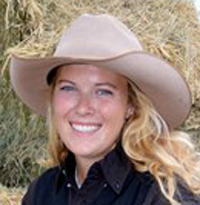 Haillie has competed in rodeos through the summer of 2014 in western Colorado and eastern Utah. She won the year-end all-around title in both the Fruita/Rimrock (Colo.) 14-rodeo summer series Rodeo and the 12-rodeo Carbondale Wild West Series. Along with a strong showing in team toping and barrel racing, Taylor won the year-end title for both breakaway roping and ribbon roping in each series. She is rodeoing this weekend, Sept. 11-13, at the Idaho State University regional rodeo in Pocatello. Haillie, 20, is a 5-10 sophomore majoring in Elementary Education at Grand Junction. She was a girls’ basketball player and rodeo competitor while at Wood River.